Simply turn on the radio if you merely want to hear Top 40's popular music, but if you want to see the Classics done right, there is no other band but The Phonix! The Phonix are a 9-piece Canadian band from Vancouver BC that play all your Funk Soul R&B favorites. Since forming in June 2009, the Phonix has performed at over 500 events and festivals. They are a staple in the diets of thousands of funk-lovers as they diligently fulfill their role as house band at the Arts Club's Backstage Lounge, where they have performed since 2010. The band’s sound fuses heavy-hitting dance grooves with flashy horn lines, energetic instrumental solos and soaring vocals that will make you want to dance all night. “On stage, every single member is equally strong in their musicality and their delivery. This kind of chemistry from a band is a real, rare treat.” - Bill Kolter, Peachfest Entertainment Coordinator. The original band members met in music school, where most of them studied Jazz. They all shared a love for artists like James Brown, Stevie Wonder, Michael Jackson, and Earth Wind and Fire. 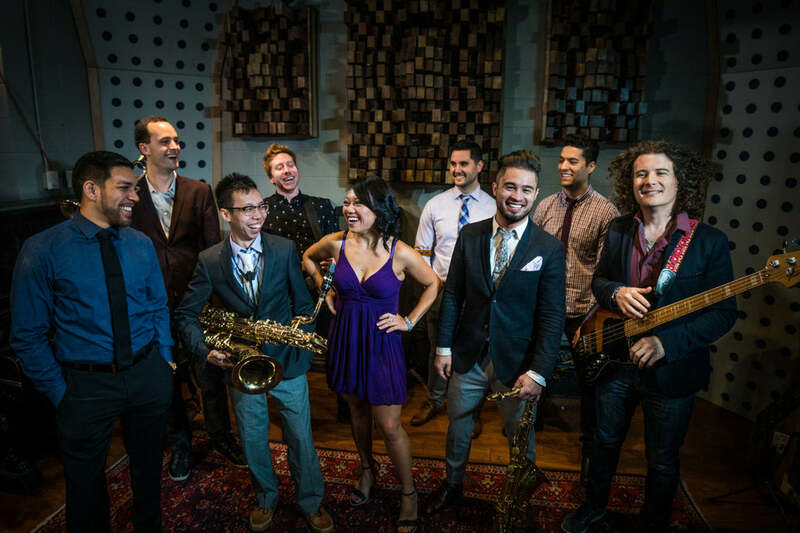 The band currently consists of Jackie Nguyen (lead vocals), Brandon Thornhill (lead vocals), Reuben Avery (trumpet), Jens Christiansen (tenor sax), Eric Tsang (baritone sax), Jason De Couto (keyboards), Jen Lewin (keyboards), Jeff Younger (guitar), Joseph Lubinsky Mast (bass) and Justin James (drums). Throughout their 8 years together, the Phonix have always enjoyed performing their covers of classic 70’s soul tunes and mixing in their own originals whenever they could. Eight years experience as a house band has gifted them with flashy choreography, captivating stage presence and an ability to sustain a high energy, exciting and engaging performance. Their infectious energy has captivated BC audiences as far as Kelowna, Penticton and Vancouver Island. They have headlined at the Vancouver Street Dance Festival as well as the Penticton Peach Festival, where they have also had the privilege of opening for iconic Canadian band, Trooper. Their vast list of performances includes venues such as the Fairmont, Sutton Place and Westin Bayshore hotels, the Red Robinson and McPherson theatres and just about every casino in Vancouver. The band released it’s first single, "Work It Out," on May 15, 2017. It is a feel-good song, intended to get you dancing and "working it out" on the dance floor. It's "Live In Studio" video received nearly 4,000 views in it's first day online. The Phonix will release 3 more singles throughout the rest of 2017. These tracks will embody the band’s classic funk/R&B sound and live vibe. The Phonix has always been a horn-heavy band, and these songs incorporate trumpet, tenor sax and baritone sax for some in-your-face brass action. Guitar, bass, drums, keyboards and percussion lay a solidly funky foundation beneath Brandon and Jackie, the band’s two soulful lead singers. You can purchase and listen on the band’s website and on over 95 other music purchasing and streaming sites across the internet. "Phonix definitely delivered for us this year at Peachfest 2015 with their special brand of energy and excitement. On stage, every single member is equally strong in their musicality and their delivery. For an audience to enjoy this kind of chemistry from a band is a real, rare treat. A crowd favourite for sure and we look forward to welcoming them back again for Peachfest 2016. Phonix is definitely one of the best groups I’ve ever seen and… I’ve seen a lot of good bands."